Featuring a tape which is only 6.35mm wide, Fujifilm DVCPRO videocassettes maximize the performance advantages of component digital recording, and deliver outstanding image quality from the world's most compact broadcast-use video format. Based on Fujifilm's proprietary ATOMM-II technology*, they represent the dawn of a new age in digital video excellence. Newly developed ultra-fine, high-energy metal magnetic particles offer significantly higher metal energy levels, with retentivity of 370mT and coercivity of 183KA/m. These superior performance characteristics allow high-density digital recording and playback with a tape that is only 6.35mm wide. A high-molecular binder material improves magnetic layer durability, and lubricants in the upper and lower layers enable the tape to withstand a wide range of operating conditions. In addition, a special backcoating keeps the friction coefficient consistently low. As a result, head wear is minimal, and tape transport stability, durability, and long-term storage characteristics are excellent. Tightly sealed high-precision, high-rigidity cassette shells prevent tape deformation and damage, promote stable tape transport, and shut out dust and dirt to help ensure a low error rate. They also feature large clear windows that allow the amount of remaining tape to be confirmed at a glance, and colored lids and transparent hard cases that make it easy to differentiate DP121 and DP1001 cassettes from one other. 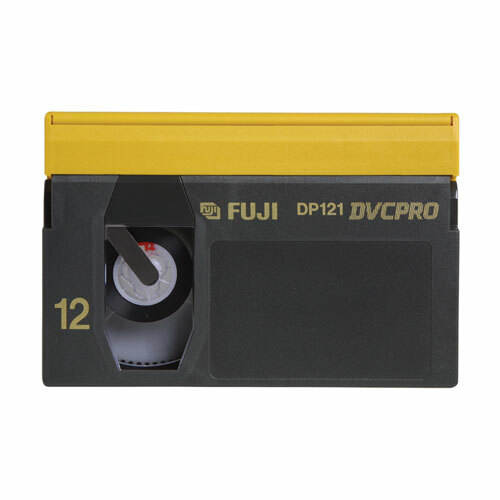 DP121 videocassette can be used in both DVCPRO systems, and in DVCPRO50* systems. * Recording time will be halved when used in DVCPRO50 systems. DP1001 videocassette is only for use with DVCPRO-HD systems. ATOMM is an acronym for Advanced Super Thin Layer and High Output Metal Media technology (hereinafter referred to as ATOMM technology and ATOMM-II technology).